Plants are always been the greatest gift to them mankind’s, from the domestication of the human life in the different centuries, they are directly and indirectly depend on the plants for the various kind of the purposes. They are the main sources of the medicines and the drugs for the treatment of the diseases, in this review article we are working on the one of the plant entitled as the Abutilon indicum of the Malvaceae family. This is the herb which is ephemeral, in nature, they grows best in the monsoon seasons and have always been utilized by the tribal communities for the treatment of the diseases. Phytochemistry is the branches of the sciences which is concerned with the utilization of the plants for the various metabolites, in this branches of the sciences we concern with the total phytochemistry (isolation, structure elucidation and the identification of the metabolites) of the plants and there utility for the treatment of the, many kinds of the diseases. Plants are the greatest gift to the human kinds, in the India as well as the other part of the world in the development of the, many civilizations, plants play a very significant role in the fulfilling the necessity of the human needs. In India the chark sanshita is the collection of the many kinds of the plants for the treatment of the several disorders, which was written by the maharishi charak in the Vedic period, India has a rich sources of the literature of the medicinal plants. After the discovery of the various kinds of the allopathic medicines, they were widely used for their rapid efficacy towards the various kinds of the disorders, however these medicines has the very strong negative effects on whole of the human system as well as they are very high in cost, so the cost of production is not very usable for the common middle class peoples. So, still today according to the report of the WHO about the 80 percent of the peoples utilizes the plants for the treatment of the disorders. Abutilon indicum is the unique member of the malvacese family, the whole plant is very useful from the roots to the seeds, and they are the reservoirs of the various kinds of the metabolites of the medicinal values. it grows in the whole wildly, from the north to the south the whole of the plants grows well in the loamy soils and the sandy soils, many of the tribal communities utilizes the plants for the treatment of the many kinds of the diseases. The genus Abutilon has the around the 150 species globally, the plant is typically a herb, around the height of the 3-5 meters, the width of the herb is (-4–6) cm, the plant form the patches in the rainy seasons it grows in the groups, the plant is adapted to the various kind of the soil, the soil many be the hard and the many kinds of from loamy to the sandy. After the rainy seasons during the winters the plants starts the formation of the seed, and the part is visible above grounds (Figure 1). 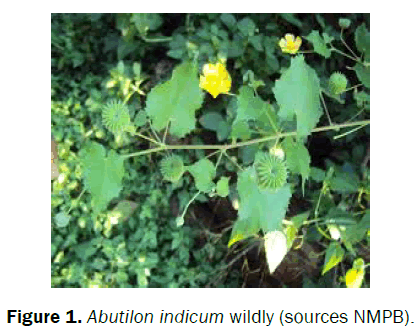 Figure 1: Abutilon indicum wildly (sources NMPB). Taxonomy of the plant: well different peoples classify the plants from the various methods; here we are presenting the one of the most accepted classification of the Abutilon indicum (Figure 2). Figure 2: Flower of the Abutilon indicum (sources NMPB). The plant is commonly known as the kanghi or the Atibala, Balya in Sanskrit. 1) The plant is herbaceous weed. 2) The plant generally grows in the form of the dense patches in the wastelands. 3) The stem of the plants is yellow, and at the later stages they turn into the tomatoes. 4) The leaves are oval and the acuminate lobed. 5) The flower are typically yellow in color, the pattern of the arrangement of the flower part is typically of the malvaceous type. 6) The stamens are the abundant, and they are monothecous. 7) The fruit are capsules and they forms the ridges on the fruit, which is the common term entitled as the kanghi. Some of the phytochemistry work of the Abutilon has been done by the different peoples in India as well as the other part of the world. Some of them are enlisted as which shows the presences of the different kinds of the metabolites in the different part of the plants . They utilizes the difference in chromatographic methods and the solvents for the differ solubility of the metabolites, some of them works on the antimicrobial role of the metabolites which demonstrates the difference in medicinal role of the paints or the weeds scientifically which were utilizes by the tribal community from the long decades. Also there studies indicate the potential usages of the Abutilon indicum stem, in the treatment of the convulsion disorders (Figure 3). 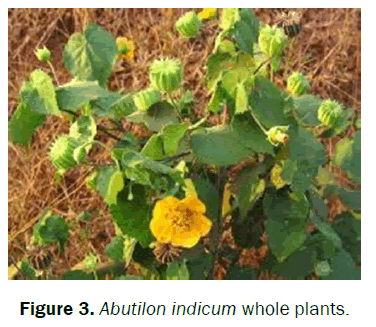 Figure 3: Abutilon indicum whole plants. Chemical constituents of the Abutilon indicum were investigated ; they investigated on the chemical constituents of the whole plants of the Abutilon indicum, there results shows the two components Abutlilin A (1) and (R)-N(1-methoxycarbonyl,2’phenylethyl)4 hydroxybenzate as well as 28 compounds. They utilised the NMR technologies for the structure elucidation. One of the significant phytochemical investigations ; p b-D-Glucosyloxybenzoic acid, Hydroxybenzoic, Caffeic acid and have been isolated from the complete plant of Abutilon indicum. Phytochemical and the pharmacological investigation of the leaves of the Abutilon indicum showed  the results indicate that the leaves contain the steroids, sapogenins, carbohydrates, and flavoneins. They analysed the metabolites for the blood glucose levels. One of the good works ; the summary of their work has been presented as petroleum ether extracts, benzene extract, chloroform extract, ethnolic extract and aqueous methonolic extract, were subjected to the preliminary phytochemicals investigations for their presences and absence of the phytochemical constituents. Antibacterial activity of the various extract of the Abutilon indicum against the various pathogens has been evaluated  beta d glucosyloxybenzoic acid, pera hydroxybenzoi, c acid, caffiec acid has been isolated form the whole plant of the Abutilon , as they analyses the IR, UV, NMR spectroscopy and chemical methods for the isolation of the compounds . However in addition to that another amount of the work can be presented over there. Abutilon is the is the genus of the great concerns, it is the reservoirs of the many kinds of the metabolites of the great medicinal values, well it is widely distributed genus throughout the world, but the improper knowledge’s of the people towards its medicinal values and the other beneficiation to the ecosystem are overlooked by the peoples, so it is at the edge of the disappearances in many areas of the hot climates. Well the species is least concern and needs proper investigation for the treatment of the various kinds of the diseases. Abutilon indicum is the reservoirs of them any metabolites of the medicinal values, the plant always used by the tribal community from the centuries for the treatments of the many disorders, however prolonged work are required for the other species for the isolation of the many kinds of the metabolites the various significances. Saravanan R, et al. Antibiotic activity of various extracts of abutilonIndicumlinn. Againast various pathogens. World journal of pharmacy and pharmaceutical sciences. 2016; 5: 1358-1364. 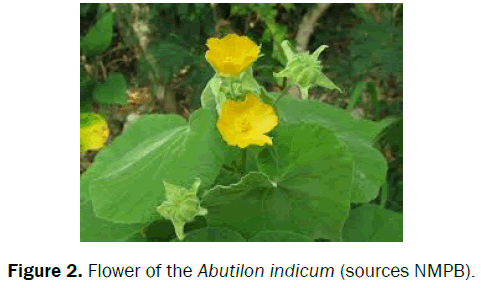 DhanapalV, MaheswariS.pharmocognostical and phytochemical evaluation of stem of abutilon indicum, international journal of pharma sciences and research (ijpsr).2014. KuoPC, et al. Chemical constituents from abutilon indicum. Journal of Asian natural products.2008;689-693. LakshmayyaNNR, et al. Phytochemical and pharmacological evaluation of leaves of abutilon indicum. Indian JTradit Know.2003;2:79–83.